Whether you are starting school, continuing your studies or just like to keep organised when it comes to your stationery. 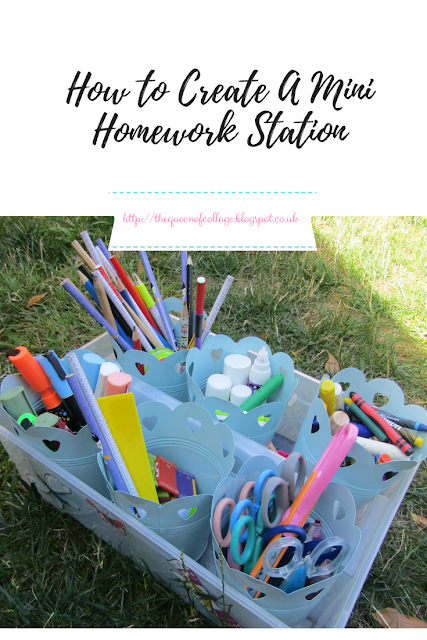 I'm sure you will agree that this mini homework station will keep things neat, tidy and on hand for when you need the items.It's certainly helped us when it has come to doing our arts and crafts while also being handy for measuring up the porch walls. I love recycling and when this handy caddy came up for grabs for free on a local site I just had to have it alongside some plastic tubs that instantly got put to use. For a while the caddy sat on a shelf and had me questioning how I could put it to good use. Then inspiration struck to use it as a place to keep my stationery. I headed to a shop not instantly known for its garden range but has a range of things on sale for both indoors and out (B&M). There I picked up 6 garden pots in my favourite colour teal and made sure they fit there and then by placing them in the caddy I'd brought with me. Back home I decorated the caddy with some remaining wall decor (butterflies) and gathered all my stationery supplies together. I designated one pot to each type of stationery. The pencils being in one, erasers in another and so on. Each pot is easy to remove from the caddy if you just wanted to use one of them or alternatively the whole caddy can be moved via its handle if you are working on a creative project. I'm sure this mini homework station will come in handy for years to come and be something we turn to time and time again. 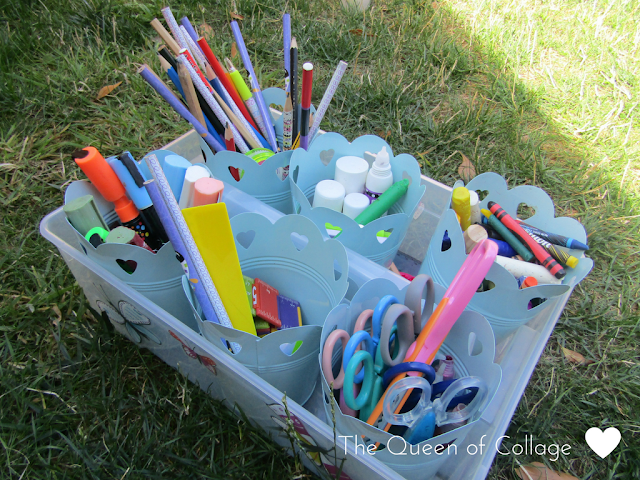 Have you created a mini homework station like this before? As always I love reading your comments. What a fab idea. I have so much stationery and my boys are slowly catching me up with theirs! I think we could do with a few of these.